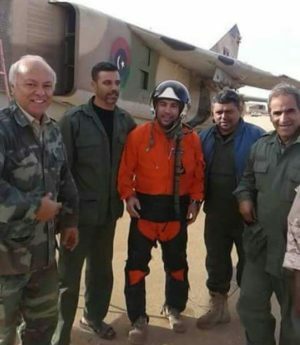 A Libyan air force Mig 23 crashed today in Benghazi during an airstrike on Ganfouda. The pilot and company-pilot ejected safely. A Libyan National Army spokesman said the warplane had suffered a technical failure with one account saying it had exploded while firing rockets. 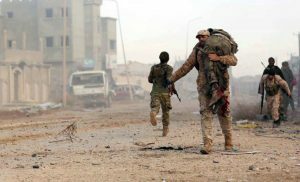 The spokesman denied an earlier report credited to a LNA commander that the aircraft had been hit by ground fire. “If we say an aircraft has been hit it has been hit” he said, “If we say it was technical failure, it was technical failure”. The Mig’s pilot Younis Al-Dinali and his co-pilot survived the explosion. However four more members of the Saiqa Special forces, including an unnamed field commander, died today in Ganfouda. Two members of the unit were killed yesterday. In the other terrorists enclaves in the city, Sabri and Suq Al-Hut, army engineers appear to have almost completed a series of sand berms that block roads and open ground surrounding both these downtown districts. There are unconfirmed reports that the LNA is preparing an assault. 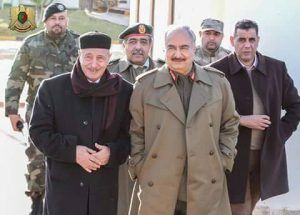 It has emerged that yesterday armed forces commander-in-chief Khalifa Hafter had a meeting at his Al-Rajma HQ, some 27 km east of Benghazi with LNA western area commander Colonel Idris Madi and his southern area opposite number 12th Brigade commander Mohamed Ben Nayel. House of Representatives president Ageela Saleh was also present. Today it is reported that Hafter also had talks with interim prime minister Abdullah Thinni, also at Al-Rajma. This article has been updated. It stated wrongly that the Hafter meetings were in Marj.